(895402):1-door, manual 54 Gallon 65" x 23.25" x 34". (895403):1-door, manual 54 Gallon 65" x 23.25" x 34". (895401):1-door, manual 54 Gallon 65" x 23.25" x 34". (895405):1-door, manual 54 Gallon 65" x 23.25" x 34". (895400):1-door, manual 54 Gallon 65" x 23.25" x 34". (895422):1-door, Self-close 54 Gallon 65" x 23.25" x 34". (895423):1-door, Self-close 54 Gallon 65" x 23.25" x 34". (895421):1-door, Self-close 54 Gallon 65" x 23.25" x 34". (895425):1-door, Self-close 54 Gallon 65" x 23.25" x 34". (895420):1-door, Self-close 54 gallon 65" x 23.25" x 34". Conveniently-sized cabinet fits virtually anywhere - slim width adds extra storage space where wide cabinets won't fit, while extra depth ensures maximum capacity. 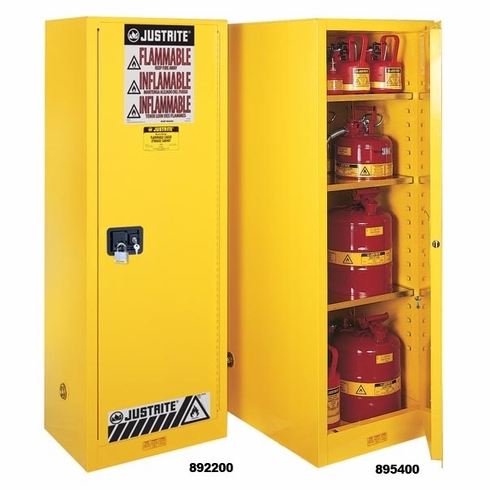 Justrite Deep Slimline Safety Cabinet provides compliant, fire-resistant storage for flammable liquids. Justrite® Steel Safety Storage Cabinets Constructed of fully-welded, 18-ga. galvanized steel with powder coat finish. U-Loc™ paddle handle with slip-resistant grip. Features fail-safe, 3-point self-latching system and 2 keys, and will accept a padlock for added security. Spill Slope™ shelves adjust on 3" centers and have built-in troughs to catch drips and lead to leakproof sump. Haz-Alert™ reflective labeling for added safety.FM approved except 4-Gal. cabinets Meet OSHA and NFPA Code 30 standards. Slim Line Slim width allows extra storage space. Extra depth ensures maximum capacity. Finished in a chemical resistant powder coat paint, this 54-gallon capacity unit combines durability and safety into a space-saving design. Ideal for expanding storage alongside existing 60 or 90 gallon, 34" deep cabinets. Other extras include four adjustable leveling feet, a continuous piano hinge for smooth door operation, and a large, trilingual warning label identifying contents. Third-party testing ensures that the highest safety standards are met. NFPA Code 30-Section 4.3.3, and have FM approval. Extra features of the self-close style include concealed door-closing mechanism for obstruction-free access to top shelf, and a fusible link that holds door open and melts at 165°F for automatic closure.